Marrakech, Morocco 14 to 15 December 2015. 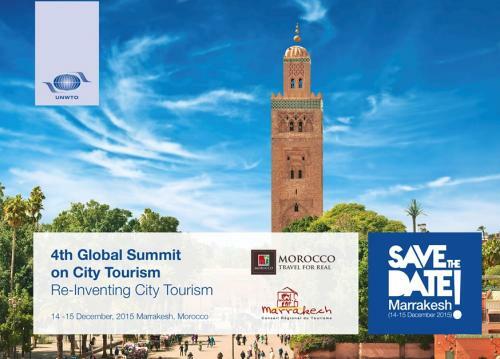 The World Tourism Organization (UNWTO), at the kind invitation of the Regional Council of Tourism of Marrakech, an Affiliate Member of UNWTO, and with the support of the Ministry of Tourism of the Kingdom of Morocco, is organizing the 4th Global Summit on City Tourism: “Re-Inventing City Tourism” in Marrakesh. To provide a comprehensive framework of the extrinsic and intrinsic changes in city tourism as regards planning, governance and operational processes. To explore the ways of maximizing the quality visitor experience while safeguarding and enhancing the quality of life for the local community by providing economic, social, cultural and environmental benefits. City Tourism patterns; positioning city tourism in the global marketplace: Quantitative and qualitative approach. Sustainable development and effective management of competitive city destinations as complex and diverse systems of interrelated economic, social and environmental phenomena and networks: “overall quality visitor experience”. Spatial organization and rejuvenation of “tourist cities”: “accessible tourism for all” and “cultural heritage management”. Connectivity and City Tourism competitiveness. The impact of the meetings industry and mega events. ENAT Managing Director, Ivor Ambrose will speak on "Accessible Tourism for All" in relation to City Tourism. Download the Concept Note in PDF format from the right-hand panel in English, French and Spanish. Download the Preliminary Programme in PDF format from the right-hand panel (in English). More information and Regsitration at the UNWTO website. Would you like to get regular updates on the event? Please send an e-mail to Mr. Sascha Stange: destination@unwto.org.